Why are the CMU police even on the trail? That trail does not go through the CMU campus. They are likely just using it as a shortcut from the main campus down to the CMU buildings on 2nd Ave.
At this rate, it’s only a matter of time until there is a collision between a motor vehicle and a pedestrian or cyclist. I don’t recall, has anybody tried to get one of the local TV stations interested in this? Seems right up the alley of local news. People on this board have done all the right things by contacting city department (police and public works) supervisors and elected officials and the problem has continued. I’d think one of the TV stations would pick this story up. What I saw did not indicate short cut taking since tbey turned around once the arrived at the end…Im pretty sure if spmeone call cmu security, we’ll get answer. Shouldn’t cops or other motorized vehicles using the trail for official purposes have their lights flashing? Winthrop is on the other side of Forbes Ave. 3/4 mile from the end of the trail, halfway between Fifth and Forbes. Nowhere near the trail. If the police aren’t responding to an emergency, then I don’t think they use flashing lights. That’s supposed to be a signal for all other vehicles to pull over and let them pass. No flashing lights means you treat them like any other traffic. If they’re just looking to see if a fleeing suspect might have gone down the trail, I wouldn’t expect them to use flashing lights. Also entirely believable they were sent there to intercept someone trying to flee. From what limited info I see here, this one sounds like routine police work. Would a flexible plastic bollard (or a nice solid one for that matter) _actually_prevent_drunks_ from driving their vehicles on the trails and mowing down cyclists and plowing into a railing? They’ll just drive right on through locked metal gates, over plastic bollards, cut zip ties, move boulders, etc… drunk or not. I’m sure it’s possible to make a barrier that cars can’t get past (without a key to unlock), on the EFT or JH trails. It would be easier on the EFT because the entry points are more controlled. Please tell me that PghPolice were able to apprehend the individual responsible for this. I know that if you damage a utility-pole the electric company (who owns the pole) will bill the vehicles owner or insurance company for the cost of replacing the pole & labor to fix the lines, etc. I hope that Friends of the Riverfront (or whoever owns this) goes after the driver to repair this. I think they got him…I think an appendage of his body has replaced the pink thingy on the JH trail gate. @paulheckbert: I guess this conversation is continuing on this thread…or move it. You do not lose major pieces of the suspension and/or drivetrain of your car and get very far afterward. > You do not lose major pieces of the suspension and/or drivetrain of your car and get very far afterward. well, not in the car, anyway. however, I will be strongly opposed to any new barriers or poles on the trail unless they are very well lit and reflectorized. It’s not that long since someone was killed running into a bollard on an Ohio trail, and I know riders here who’ve been hurt or damaged their bikes on trail barriers. 6:50PM : gate open, closed it as we passed. 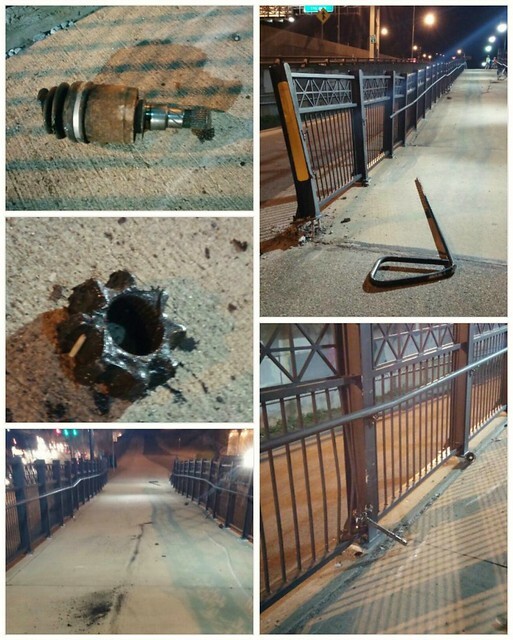 Last year, my friend R. encountered a visiting cyclist riding Pgh-DC who hit one of the bollards on the SouthSide Trail, in Duquesne at Grant Ave iirc. It was an older cyclist and he was really injured. Spent 4 or 5 days in the McKeesport UPMC facility. Trip over, and a long recovery to go. 4/15: 5:35am: gate open. I closed it. 4/15 1205 noon gate open,,,in a hurray and left it that way..
4/15 10:30 am gate open, DPW pickup truck driving away from it on the trail…they appear to have left it open behind them. Disappointing. 3pm I closed the open gate. 8:30 PM Gate open, we closed it. 2016-04-15 @ 18:25 gate closed. 2016-04-16 @ 15:45: gate closed; did not check for a zip. 810pm…gate closed..I DID check for zip….it was there. 4/18 10:08am gate open, city truck drove through open gate, left it open. I ended up with some noodling time today and decided to check into the gate data. Let me be the first to say that this is not all that satisfying: in its current form it doesn’t say that much about when exactly cars trespass on the trail. I folded things into a week period because it seemed useful. Which it is. An analysis that tries to predict likely open times would be more likely to do it (basically, marking intervals between “close” and “open” events and noting cumulative density). 1) It’s a workday phenomenon. Not really that much open gates on the weekend. It also implies that the action happens at the start and end of the day. 3) For some reason cyclists (at least the ones reporting on this thread) are pretty scarce on Mondays and Thursdays. Without any clear evidence, I suspect that the trespassers are people who come through on the way to work (north) and back (south). But we need more data and some actual pics. It should soon be reasonable to plan a stake-out (or a steak-out, if the weather is nice). 4/18: 530am: gate was closed when I went through. 7:10pm: gate was found open, so I closed it. Thanks for looking at the data. Ahlir, that’s a great start and the week binning is exactly what I was thinking of doing as well. Here’s the form for those like me who keep loosing it in this thread! It’s great seeing so many reports! 2016-04-19 @ 18:05 gate closed, did not see any zip tie. @20:30 gate closed, no zip tie.